I JUST FINISHED DESIGNING TWO NECKLACES THAT ARE PERFECT FOR ANYONE THAT BELIEVES IN LIVING OUT LOUD AND DOING SOMETHING WORTH CROWING ABOUT. IS THAT YOU? READ ON! 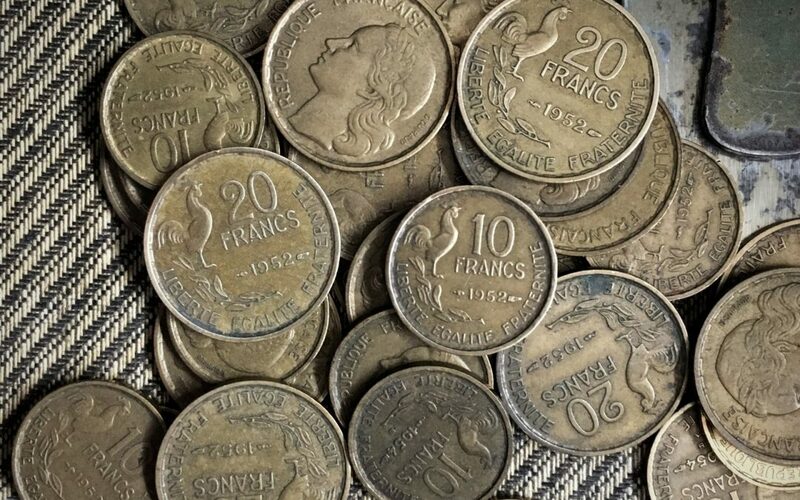 I have been sitting on some french coins for a while now. Not sure what to do with them, but having affection for them still, they’ve been sitting in a holding drawer waiting for their day in the sun. It was said by Robert Coates, an actor who died in 1848. Known for his eccentricity, he was man who wanted to be noticed and heard. A person who lived out loud and unapologetically. That quote was something that he put on a type of sign that protruded from his custom built carriage. Along with the phrase, the sign featured the image of a rooster. I IMMEDIATELY THOUGHT OF MY ROOSTER COINS AND KNEW I FINALLY HAD TO DO SOMETHING WITH THEM BECAUSE THIS QUOTE WAS THE PERFECT SENTIMENT FOR THEM. I did some more research online about the rooster and why it would be a symbol on a french coin. I LEARNED THAT A ROOSTER IS THE UNOFFICIAL SYMBOL OF FRANCE BECAUSE OF A SIMPLE PLAY ON WORDS. After the collapse of the Roman Empire and the formation of Gaul (a region which included France) which is very similar to the latin word for rooster, Gallus. France still uses a rooster as a symbol in many different ways, including sports mascots. Over the next few days, as I worked on my jewelry designs, I learned that 2017 is the year of the rooster and so the timing could not be more perfect. WHAT DOES THE ROOSTER REPRESENT IN THE CHINESE ZODIAC? The Rooster is a Chinese symbol of honesty, as well as physical and moral fortitude. It is of the yang attribute and signifies fortune, luck, fidelity, protection as well as bossiness. I hope you find these rooster facts interesting. 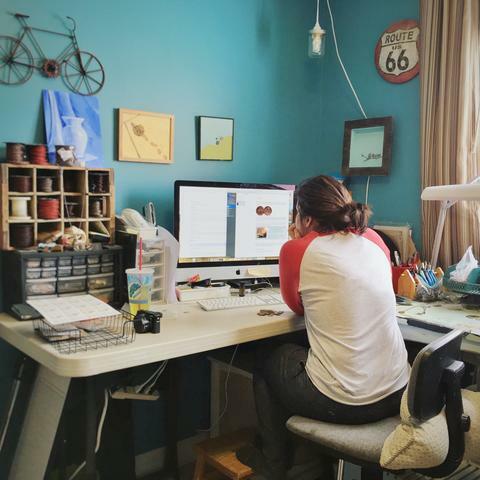 This is one of my favorite parts about collecting and using coins in my designs. I just love learning these little nuggets of mostly useless knowledge. The coins themselves are so beautiful. They were all minted in the 1940’s-50’s and have a wonderful patina that I leave in tact, polishing only the design portion to make it really pop. I came up with two designs for these coins. 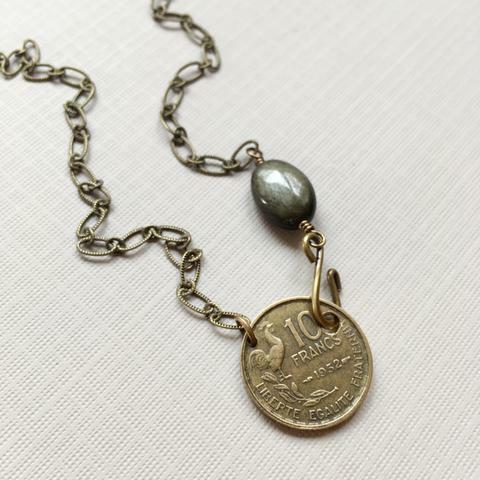 One, uses the larger 20 franc coin, pyrite gems, and antiqued brass chain. 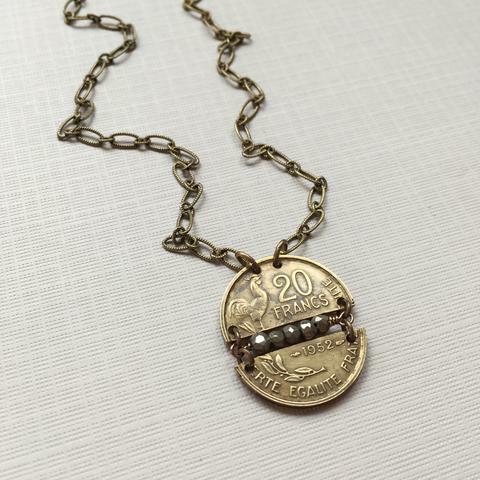 The second design uses the smaller 10 franc coin, a gorgeous gold shimmer onyx bead and front clasp design feature that I am loving. The name is the best part. I AM CALLING THESE PIECES, “MAKE SOME NOISE”. Because I am a firm believer in living out loud, sharing your heart and doing something you believe in enough to crow about.